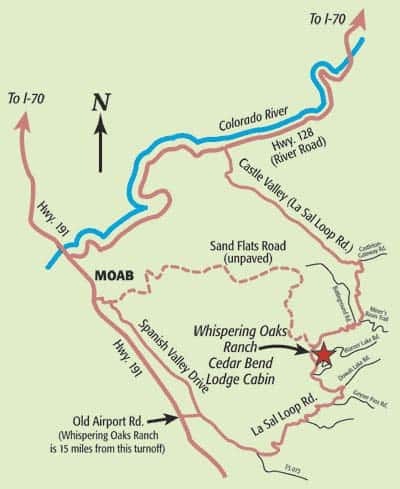 Whispering Oaks Ranch is located on the iconic La Sal Mountain Loop Road, approximately 20 miles southeast of downtown Moab, Utah. GPS can be unreliable in the areas outside of Moab and cell service is intermittent outside of town. Please review & print our written directions to have in hand while you travel. From Moab via Hwy 191, Quickest route 35 – 40 mins. Travel South on Hwy. 191 approximately 5 miles from South Moab. Turn left on Old Airport Rd. Sign will read “Ken’s Lake” & “La Sal Loop Rd”. Turn right on La Sal Loop Rd, travel 15 miles. Signs will read Whispering Oaks Ranch. From Moab via Hwy. 128, Scenic route 45 mins.–1 hr. Heading North on Hwy. 191 turn right on Hwy. 128 (before Colorado river bridge), travel 15.5 miles. Turn right @ Castle Valley (La Sal Loop Rd.) Sign will read “Castle Valley”, travel 10.6 miles. Turn right on La Sal Loop Rd. Sign will read “Moab 45 miles”, travel 10.1 miles. Cedar Bend Lodge will be on your left and the other cabins will be on the property to the right. From Hwy. 191 turn on 400 East, travel .7 miles. Turn right on Millcreek Dr. travel .4 miles. Go straight on Sand Flats Rd. There is a pay station to enter this recreation area (pavement ends). Travel 19.4 miles. Turn right on La Sal Loop Rd. (pavement begins), travel 1.6 miles. Cedar Bend Lodge will be on your left and the other cabins will be on the property to the right. (This route will not take you through Moab) From Grand Junction take I-70 West toward Green River, UT travel approximately 43 miles. Take Exit 204 for UT Hwy 128 (Cisco). Turn Left onto US-6/Hwy 128 travel approximately 1 mile. Take your first Right onto Hwy 128 travel approximately 26 miles. Turn Left onto “Lasal Mountain Loop Rd” toward Castle Valley. After 10.6 miles turn Right to stay on Lasal Mountain Loop Road (sign will read “Moab 45 miles). Travel 10.1 miles, Cedar Bend Lodge will be on your left and the other cabins will be on the property to the right.